Life had been a series of revolving doors for Beau. By the time he was relinquished to the Juneau Animal Rescue (JAR) in the spring of 2012, he had already lived in at least a handful of different homes. He was relinquished this time because his current family, whom he had lived with for five years, was going through some life changes that didn’t allow time for a dog. The details of his other homes are unknown. What was known is that, although Beau was still healthy and spry, he was already 10 years old and it was uncertain what the future held in store for him. Melissa had dogs when she was growing up, but she had never adopted a dog on her own. She was finally living in a rental that allowed animals—her major impediment until then—so was keeping her eye open for a good match. At the time Beau was placed up for adoption by JAR, Melissa was working at the Juneau Empire. She was very familiar with the “Pet of the Week” photos that JAR would place there, and that is where she first saw Beau. Her interest was immediately piqued because, as she said, “he was just so cute with these giant ears.” He was also small—a Miniature Pinscher—which was what she was looking for. She went to meet him right away, and Melissa says they had “an immediate bond.” Beau was friendly, didn’t bark at her, and he was a good snuggler right from the start. She applied to adopt him, and he was soon on his way home. As she began to introduce Beau to friends, she realized that his typical response was to bark at people he didn’t know. Only then did she realize just how remarkable it was that Beau never barked at her. He would also initially be a bit territorial around strangers, but once he saw that everything was OK he would settle down. For a 10-year-old dog, Beau was very lively and in good health. He had a good appetite and all his teeth. She did find out that Beau had had surgery when he was younger, the result of a dog fight. He would also occasionally have “accidents” in the house, which Melissa dealt with. It did make her wonder, however, if this tendency might have contributed to him being re-homed so many times. Curious about his background, Melissa did a little investigating on her own. She learned that Beau was originally born in Oklahoma in 2002, but he had been in Juneau since he was about two years old, with a number of different families. She suspects that his short tenure in some of those homes was probably a combination of family circumstances and his accidents. He also had a reputation as an escape artist. Melissa’s favorite thing about Beau was that he was really good at comforting her. She says that he seemed to know if she was feeling stressed or unwell, and would just curl up and snuggles with her. Melissa’s partner Todd says he found it really endearing “how bad Beau (was) at being a dog.” By that he means that Beau didn’t like to play fetch and rarely came when you called him. Instead, he was more like a human—he could ignore you all day and then come to you for attention when he was ready. When he was younger, Beau loved to walk, and Cope Park was his favorite venue. Later, at age 16, he napped more than anything. He loved to burrow under blankets and relax on his memory-foam bed. Melissa says his real true love in life was food, especially what they jokingly called “floor snacks”—any food that accidentally dropped during meal prep immediately attracted Beau’s attention. As a Miniature Pinscher, Beau definitely exhibited some endearing traits of that breed. He pranced around in a manner that resembled horse dressage. He also had a variety of barks, including his intruder bark and his attention bark. He was especially entertaining when he combined his barks and his prancing. 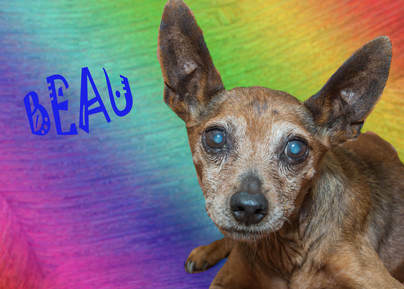 Not surprisingly for an older dog, Beau had some health scares. One of the more serious was in October 2016 when he had emergency surgery to remove his gallbladder. He was quite ill and wasn’t expected to survive, but he did. After that, Melissa says her vet was always surprised and happy to see that Beau was still around for nearly two years post-operation. In 2017 he had a seizure and additional medications were added to help control his health issues. Luckily, being food-oriented, he was good at taking his meds. Todd says they simply put all of his daily meds in a pill pocket and he swallowed it right down. Each of his health scares were emotionally trying. However, in spite of being a bit wobbly—likely due to old age and as a side effect of his meds--he still had a good quality of life until his last weeks. He liked to eat, drink and snuggle, and for all of them, that was good enough. He was most bonded to Melissa but would cuddle up with Todd when Melissa was away. He liked to be in the same room with his humans, and was very special to both of them. At the time of the interview, Melissa and Todd didn’t know how much more time they would have with Beau, so they made every day count. He was with them less than a month longer, dying at age 16. For his part, Beau was very lucky to have finally found his forever family who loved him dearly. and I don’t mind where you’ve been. Story & Photos by Juneau Animal Rescue volunteer & Board Member Kerry Howard. Beau was the first dog that Melissa Griffiths adopted from JAR. She and Todd Mace were very happy he was part of their family.